Once the potential energy generation from a project has been determined, based upon head, flow, and turbine type, the next step is to determine the value of the electricity generated. Initial discussions with the local electric utility can determine the value energy can be sold to the electric utility and identify interconnection requirements. Interconnection requirements and the value of the energy can vary considerably depending on the electric utility and size of the hydroelectric generation facility. The most likely purchaser of the generated electricity for a given project is the local electric utility. Most of Wyoming’s electric utilities, including investor-owned electric utilities, rural electric cooperatives, and municipally owned utilities, are regulated by the Wyoming Public Service Commission (PSC). 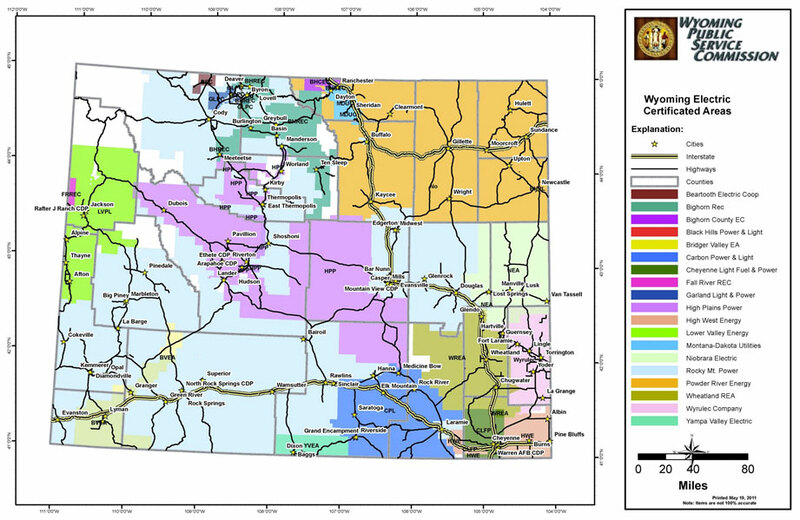 Figure 47 shows the service areas for electric utilities in Wyoming. Energy is typically sold in kilowatt-hour (kWh) increments through a power purchase agreement (PPA) for systems larger than 25 kW. A PPA is a contract between the owner of the electric generation facility and the purchaser of the electricity. The PPA defines the conditions of the sale of electricity between the two parties and can include delivery of electricity, penalties for under-delivery, payment terms, and rates and termination. In addition to purchasing energy, a utility will typically pay a firm capacity price if a minimum capacity measured in kilowatts (kW) can be guaranteed. The firm capacity price could potentially increase the power revenue approximately 30 to 50 percent. Utilities typically purchase energy at an avoided cost less than the retail rate. Avoided costs are essentially the marginal cost for a public utility to produce one more unit of power. Since purchasing energy from a qualified facility will reduce the utilities need to produce this additional energy themselves, the price utilities pay a qualified facility’s generated energy has been set to an avoided, or marginal cost. These prices are designed to simulate a “market price” for energy. Some utilities in Wyoming, such as investor-owned utilities, have avoided costs on file with the PSC. Utilities that have avoided costs on file with the PSC provide a straightforward way to assess the value of power. Due to regulatory structure, most rural electric cooperatives do not have avoided costs on file with the PSC. In a case where a utility has not established an avoided cost, negotiations are held on a case-by-case basis. This process can be time-consuming and would need to be approved by the PSC prior to execution of a power purchase agreement. Interconnection requirements and costs vary depending on the electric utility, size, complexity, and type of interconnection of the project. Most project interconnections will also require approval by a state electrical inspector. municipally owned utilities are excluded) are obligated to provide net metering for systems up to 25 kW. Generally, the interconnection requirements under net metering require the use of switching equipment capable of isolating the system from the grid. Net metering is described in more detail below. For larger “small” hydropower systems (greater than 25 kW), the local utility will likely require an interconnection study to determine whether or not the project would cause any adverse impacts on utility infrastructure or operations. This study is typically completed by the utility and paid for by the owner of the facility. Results identify the interconnection requirements the customer must fulfill to connect the unit to the utility grid. Some utilities have specific interconnection requirements while others may simply follow or comply with the nationally recognized IEEE Standard 1547. Net metering is an electricity sales arrangement for consumers who develop small scale energy facilities. Under a net metering agreement, electricity from an eligible consumer-owned generation facility is used directly by the consumer. Generation in excess of the consumer’s use is exported to the utility (grid). Consumer needs in excess of the self-generation is obtained from the utility. Meters record the energy generated (kWh) by the generating facility and the energy consumed from the electric utilities grid. If more energy is generated than consumed, the excess energy can be exported back into the grid, and the consumer receives a credit. The credits are usually carried over every month and at the end of the year, any credits remaining are paid at the avoided cost. When load (electricity usage) is sufficient to use a large fraction of the electricity generated, then a net metering agreement is generally the most financially advantageous arrangement for a small hydropower facility (under 25 kW). Instead of selling the energy at an avoided rate, which is much less than the retail rate, the consumer can use the generated energy from the small hydropower facility to offset the retail rate purchased from the utility. This is the primary advantage to net metering. This is a typical scenario; however, net metering policies vary by each utility. Some utilities limit the amount of energy that can be generated, size of the generation facility (typically 25 kW or less), and how much the credits are worth. Net metering programs are adopted on a state level of legislation, and in Wyoming, investor-owned utilities are required to make net metering available for systems 25 kW or less. When considering net metering, knowing the local utilities policy on net metering and how the excess generation will be sold or credited is important. In addition, knowing how far the generating facility is from the adjacent load and whether the annual electric load of the adjacent facility matches that of the proposed generation facility is also vital. Under Wyoming law, electricity cannot be sold to another entity in the franchised service area; it must be used by the generator, sold to a utility, or sold to a distant entity through a wheeling agreement with the intervening utility. A Renewable Energy Certificate (REC) represents the property rights to the environmental, social, and other non-power attributes of renewable electricity generation. 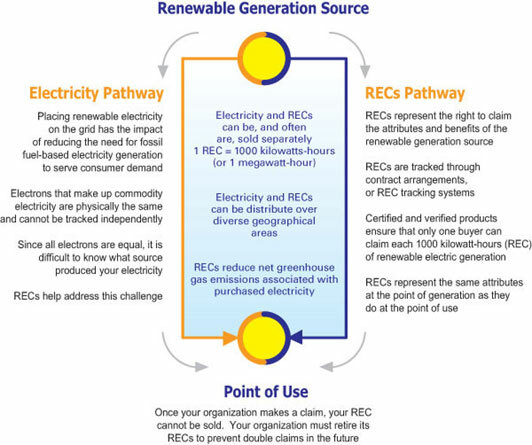 An REC, and its associated attributes and benefits, can be sold separately from the underlying physical electricity associated with a renewable-based generation source. RECs are tradable instruments that can be used to meet voluntary renewable energy targets as well as meet compliance requirements for renewable portfolio standards. This allows organizations to support renewable energy development and protect the environment when green power products are not locally available. As renewable generators produce electricity, they typically create one REC certificate for every 1,000 kilowatt-hours (1 megawatt-hour) of electricity placed on the grid. Each REC denotes the underlying generation energy source, location of the generation, and year of generation, environmental emissions, and other characteristics associated with the generator. Unlike electricity, RECs do not need to be scheduled on a transmission system, and they can be used at a different time and location than the moment of generation. The generation source has to be certified by an independent certification process and then RECs can be tracked and sold through various tracking systems. The Western Renewable Energy Generation Information System (WREGIS) is an independent renewable energy tracking system for the Western Interconnection, the geographic area of the Western Electricity Coordination Council (WECC) that includes parts or all of the western states, including all of Wyoming, Colorado, and Montana. WREGIS tracks renewable energy generation from units that register in the system and creates RECs for this generation. WREGIS users have private accounts similar to bank accounts in which certificates are deposited upon creation. Once a certificate is created, it can be transferred, retired, or exported to a compatible tracking system according to the needs of the certificate owner. For example, if a hydropower facility in Wyoming generates 4,000 megawatt-hours (MWH) a year, the owner of the facility reports the generation to WREGIS and 4,000 RECs are created and deposited into their account. An electric utility located in California, which has a Renewable Portfolio Standard (RPS) and is required to provide a specific percentage of renewable energy, can then purchase the RECs generated by the Wyoming hydropower facility. The RECs are transferred from one account to the other and then retired so no other users can claim the REC. REC prices vary according to the market trends in the voluntary and compliance market. Renewable Portfolio Standards (RPS) require electric utilities to provide specific percentages of renewable energy by certain dates, helping to support development of new renewable energy, including hydropower. Wyoming does not have a Renewable Portfolio Standard (RPS) so the local market is purely voluntary, and REC pricing is low. Adjacent states such as Colorado and Montana do have RPS, and RECs can be sold to utilities or other parties in these states.